Students are picky about food, and it’s influencing their choice in schools. But providing healthy, convenient and stimulating dining services isn’t easy. And keeping your staff up-to-date with the latest training and trends can be a full-time job. 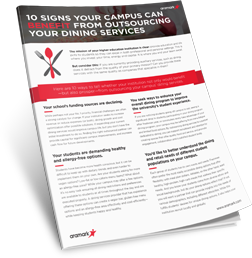 Find out if your campus could benefit from outsourcing dining services in this comprehensive guide. Get your free guide today—just fill out the quick form. GET YOUR FREE GUIDE BELOW!